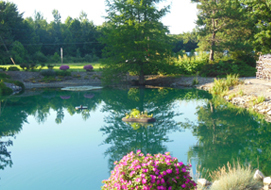 At Oak Park Landscape & Water Garden Center, experts are on hand to solve any issues with residential and commercial ponds throughout northwest Ohio. Having a problem with the water in your water garden or pond? Bring in a water sample for testing at no charge. If your pond is not crystal clear, then visit our center and talk with an expert who will provide you with the knowledge to conquer any water garden or pond problem. Pond Design — design is the most important part of a pond. If a pond is not designed correctly the first time, you can have all types of problems. Let the professionals at Oak Park Landscape & Water Garden Center help design your residential or commercial pond. Have a design in mind? Let us take a look. Whether it’s a clay or water-table-based pond, we can properly design your pond from start to finish. Aeration and Problem Control — Oak Park Landscape & Water Garden Center has a full line of pond chemicals to treat your recreational or commercial pond. If you are experiencing problems, we can help you properly treat your pond without hurting the pond or the environment. Aeration is probably the second most important factor when having a commercial or residential pond. 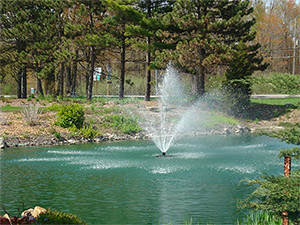 The pond must be aerated regularly to supply important oxygen to the water. You’ll find a complete supply of aeration pumps and beautiful cascading pond fountains at Oak Park. We are happy to supply everything you need to do the job yourself, or we can provide the knowledgeable help you need. Stop in and ask us about our free residential or commercial pond seminars, which are extremely popular with gardeners all over the Toledo, Ohio, area.